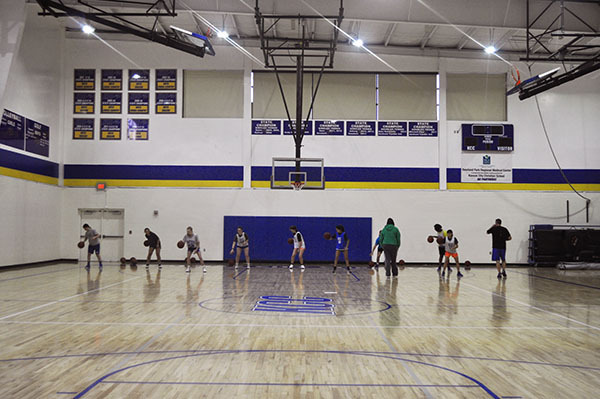 The High School girls run through a drill with Coach Jason Martin during practice. This year on both the girls and boys high school basketball teams, there is only one senior per team. The only senior on the boys’ team is Noah Tally, and the only senior on the girls’ team is Mallory Mong. . The boys varsity coach is Adam Runyan, also a high school history teacher, and the girls team varsity, and only, team is coached by Jason Martin. “He wants to work on becoming a team since there is a lot of new blood and he wants to make this season fun,” Mong said. Tally is excited for people coming to the games. “I like the home games a lot, the Friday night home games – a lot of people come to those,” Tally said. Mong is excited to have one last season with some of her close friends on the team, like Junior Camile Hardt, whose older sister Paige played with Mong on the team until she graduated last year. Both seniors knows this season won’t be easy, but they want to enjoy their last time playing basketball for KCC. Mong also wants to make the most of her last season.